In a political and economic climate so heavily influenced by Wall Street, corporate CEOs, and extremists like those who shut down the government in an effort to block even the modest reforms of the Affordable Care Act, it's sometimes hard to remember that it is still possible for nurses and working people to fight and win. Well, thank goodness for the 3,000 RNs, and a few hundred techs, who work at Sutter hospitals and facilities in Northern California. They have just delivered an emphatic message to nurses and other workers everywhere. Stand up for yourselves, stand up for the public interest and the public will be with you and you can prevail. It took nine strikes and a refusal of the RNs to buckle — much to the shock of the company executives. By the final strike, seeing support grow among the nurses with each walkout, Sutter even gave up sending the media false reports of who was allegedly crossing the picket lines. Over two years ago, Sutter threw down a gauntlet for our members at greater San Francisco Bay Area facilities. Emboldened by rollbacks for many other workers across the country and what they saw as a favorable corporate and anti-union environment, Sutter dumped a list of some 200 concession demands on the nurses. The takeaway list was breathtaking in its detail and scope, targeting virtually every area of the collecting bargaining agreements won by nurses and defended over a period stretching back over 65 years to the first collective bargaining contracts for a nurses union in the country. Most disgracefully, Sutter was insisting on eliminating paid sick leave essentially forcing nurses to work when sick, and — trumpeting a loophole in the Affordable Care Act as a pretext — terminating all health coverage for nurses and techs who work less than 30 hours per week which would have ended health benefits entirely for hundreds of RNs, techs and their families. That was just a start. Sutter also stubbornly insisted on massive cuts in health and retiree benefits, elimination of seniority rights, big reductions in holidays, vacations, maternity and pregnancy leave, less disability coverage, elimination of safety training for RNs, and deep pay cuts for nurses who work weekend, evening, and night shifts. 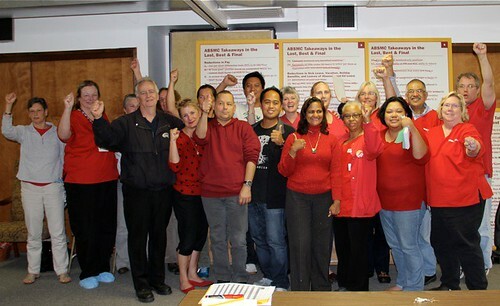 They also sought elimination of positions of RNs who provide resource support and make clinical assignments, threatening safe staffing for patients, giving preference for travel nurses over regular staff nurses who live and work in local communities, promotion of bogus “patient satisfaction” and “wellness” programs, and imposed discipline on nurses at one hospital for exercising their legal rights by participating in one of the strikes. All from an enormously wealthy employer that has rolled up nearly $4.2 billion in profits since 2005, has the highest net patient revenue per employee of any U.S. hospital system, and gives 28 top executives more than $1 million in pay packages every year. 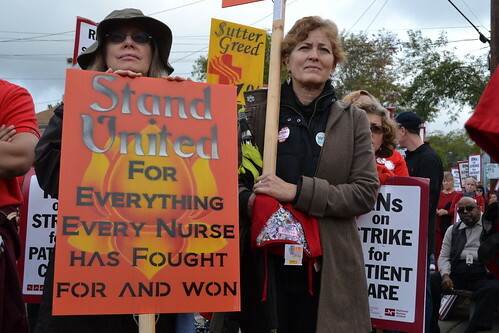 Sutter assumed that its vaults of gold, an economic climate of recession and far right attacks on unions and workers, and the victory of many employers in forcing rollbacks in pay, health benefits, retirement security, and workplace rights, would pave the way for their assault on RNs. But Sutter RNs demonstrated a different path, and an unquenchable model of how to fight hard to protect standards for their patients, their colleagues, and the future generation of nurses who follow. And they won, defeating the 200 concession demands and discipline measures, and even won some contract gains, exemplifying in their long campaign the best in the nursing profession and in the labor movement. Words can not describe the amazing spirit, courage, and dedication of these fighters in a battle against an arrogant and powerful employer determined to extract its pounds of flesh. The nurses demonstrated through unity and a willingness to stand up and say “no,” that it is possible to hold the line and win, and let workers everywhere know there is hope in this difficult era for all.